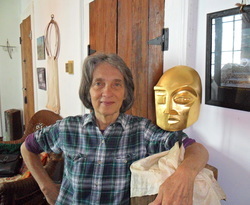 Native New Orleanian and art pioneer resident of Bywater, Phyllis Parun is a culturer par excellence, with a rich artistic and cultural European heritage. Phyllis expresses herself in a diversity of literary and studio mediums including poetry, essays, drawing, painting, sculpture, photography and film. Phyllis began a classical art education with her mother, a Louisiana teacher and graduate of LSU-Baton Rouge, and continued as a student of John McCrady in the 1950's. Her childhood classical art education and exposure to European art engendered a passion for the war years in Paris and Germany, routing her to cave paintings and then to ancient Taoist Asia. On her trek through ancient shamanism, Phyllis conducted many painting and sculpture dialogues with major western and eastern masters of the early 20th century, all of which is visible in her work. As an art community developer, she has been a part of the developing fabric of New Orleans since the 1960’s. From 1976-1980, Phyllis served the New Orleans arts community as the Visual Arts Coordinator of the Artists' Information Bureau -- a position she created -- and as the Founding President of the Louisiana Chapter of the Artists' Equity Association, and in the 1980’s she opened New Orleans' first fine and decorative arts studio. And Phyllis didn’t limit herself to studio arts. She ventured into every aspect of life that has been creatively possible in one lifetime. She has been an intimate part of enriching the culture and health of New Orleans through her endeavors in food co-op organizing, the visual and literary arts, civil rights and macrobiotic/Asian healing arts. Aprés-déluge of 2005 as Acting President of both the Artists' Equity Association of Louisiana and the Women’s Caucus for Art of Louisiana, Phyllis put together 32 New Orleans visual artists, curated two exhibits to open in central California and catalyzed a new art movement she and fellow artists named "Kataclysm". Phyllis Parun's artistic talent is unique. She has no contemporaries. In 1965, while looking at a still life Phyllis executed in his school, Mr. John McCrady had this to say, "I can almost hear that mask laughing aloud." "Phyllis Parun is an enviably talented artist who makes us aware of the sources of inspiration and the traditions in modern art that she is skillfully keeping alive."